While General Motors was one of the less successful automakers in the US auto industry in terms of year over year growth – GM still showed positive growth last month and in the long run, that is what the company is the most concerned with reporting. General Motors posted a year over year growth (meaning, compared to the same month last year) of 3.4% which ranks them below all other major automaker companies in the US. However, with 186,505 new vehicles sold in November 2012, GM was the bestselling auto group in the American market - besting Ford Motor Company by about 9,000 units. Best of all, the two GM brands that have struggled off and on throughout 2012 – Buick and Cadillac – led the way for the company in November in terms of growth. Cadillac was the top dog from General Motors in November 2012 sales growth with an increase of 30.3% also making them one of the stronger brands in the US market. Interestingly, in a month where Cadillac posted a year over year gain of 30.3%, almost every preexisting vehicle posted negative growth. Luckily, the introduction of the new compact ATS and the range topping XTS have added enough units to help GM’s luxury brand sport an impressive overall gain. The Cadillac SRX was the only model to post a positive growth with a jump of 12.8% while also being the brand’s bestseller with 5,340 crossovers sold. Every other Cadillac model that was sold in November 2012 posted negative growth but considering that most of those models are no longer in production – it isnt as bad as it looks on paper. More importantly, the new XTS ranked third in brand sales with 2,414 large sedans sold while the new compact ATS was already 4th in sales with 2,152 units sold. The CTS family was second in overall sales among the brand lineup with 2,798 sedans, coupes and sport wagons sold. On the year, Cadillac is down 3.4% compared to the first 11 months of 2011 with 131,534 units sold thus far in 2012. The Buick brand was second best among the GM automakers in terms of sales growth and like Cadillac, Buick benefitted from the addition of new models to help the bottom line. While the Regal and LaCrosse both posted negative growth in November 2012, the roomy Buick Enclave SUV was the top model in terms of both growth and sales with 4,817 units sold accounting for an increase of 22.8% over the same month last year. Helping Buick hit the brand growth figure of 22.8% was the new Buick Verano with 3,574 units sold making this compact midlevel luxury sedan the brand’s third bestselling vehicle. The LaCrosse – even with the negative growth – posted the brand’s second best sales in moving 3,797 new sedans. 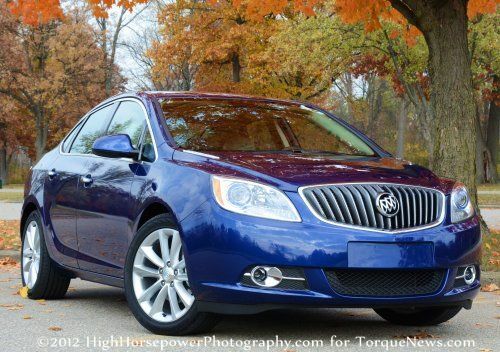 For the year, Buick is up 0.8% with 163,935 vehicles sold through the first 11 months. GMC was the third best brand in terms of growth in November 2012 for GM with a small gain of just 0.8% but a miniscule gain is better than a decline. GMC was led in growth by the Terrain with an increase of 44.3% followed by the Savana van at 38.5%. All other models from GMC was in the red in terms of growth last month. When it comes to sales volume, the Sierra pickup family was the top performer from GMC with 11,726 new trucks sold followed by the Terrain (8,158 sold) and the Acadia (3,631 sold). For 2012, GMC is up 3.9% with 369,960 trucks, vans and SUVs sold so far this year. Finally, Chevrolet had a rough November 2012, posting a negative growth of 0.03% (they sold 40 less vehicles in Nov 2012 than in Nov 2011) but with 128,867 vehicles sold, Chevy was the top seller from GM and the third bestselling brand in the industry behind only Ford and Toyota. In terms of growth, the Chevrolet Volt was the top consumer model with an increase of 33.4% while the Caprice Police Vehicle was the best overall Chevy vehicle with an increase of 68.3%. The Chevrolet Cruze was second in consumer sales growth with a jump of 27% while the fleet only Captiva Sport was next with a gain of 26%. In terms of sales volume, the Silverado pickup family was the top performer with 30,674 while the Equinox and Cruze was second and third with 16,821 and 16,807, respectively. On the year, Chevrolet has sold 1,684,555 new vehicles – up 4.3% compared to the year before. Don’t expect Chevrolet to be down for long as the rising fuel prices are helping their growing stable of efficient compact cars including the Cruze, Sonic, Spark and Volt to continue to grow in popularity.